Improved performance of solar panels energy production and energy storage. In this field, satellite observation plays a fundamental role in providing real on-ground irradiance values over wide areas, instead of using, as normal practice, simulated datasets or extrapolated historical data. In the framework of the KLAUS Project, a new system for solar irradiance estimation has been implemented, making use of an accurate geometric model and irradiance information retrieved from satellite data. 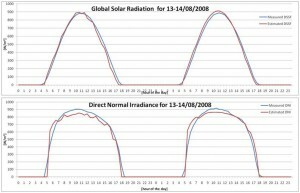 Estimation of the Direct Normal Irradiance for CPV (concentration Photo-Voltaic panels). 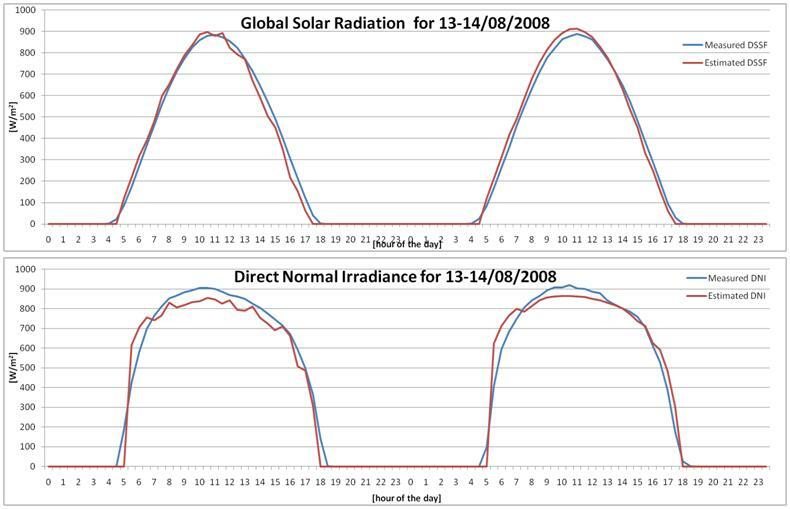 The third product is a unique service devoted to the evaluation of performance of concentration panels, since it provides information about Direct Normal Irradiance (DNI) and sun position, every 30 minutes. The validation results, performed against independent in-situ instruments, showed a very high agreement of the estimated global radiation (RMS=4.8%, BIAS=1,7%) and a good agreement of the DNI (RMS=9.4%, BIAS=18,9%).